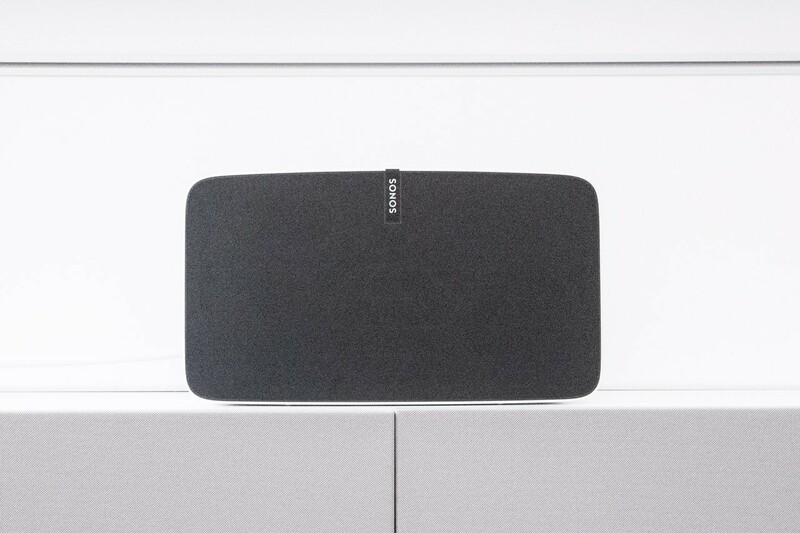 There is a new version of the Sonos PLAY:5 speaker available. Its predecessor was a convincing speaker – but will the new version be up to the high expectations? We will find out in this test review. 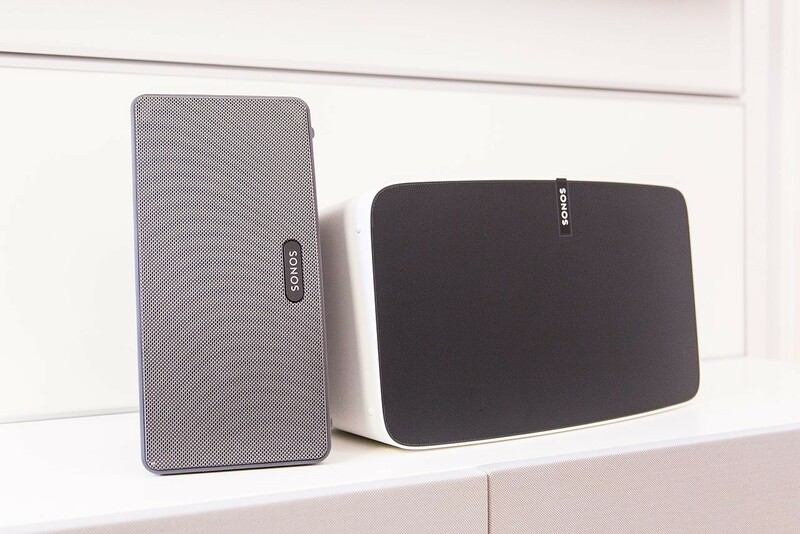 The Sonos PLAY:5 has been a trailblazer among multiroom speakers. The first version instantly impressed listeners with its power and clear sound. Now it has been remodeled from scratch: The design has been completely changed and allows vertical standing now. And you can choose between black and white color. For this test I have been using the white color version. Unpacking feels like a ceremony: Like with large flatscreen TVs, two safety pins have to be removed from the packing after which the upper part can be lifted, while the rest remains on ground. The speaker itself is also wrapped very carefully in shrink-wrapped foil, under which there is another layer of saran wrap. This is not downright eco-friendly, though. 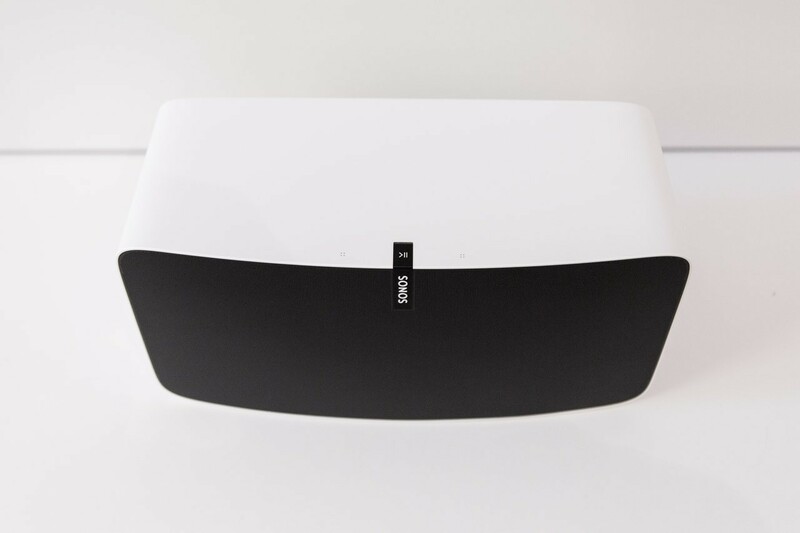 Sonos setup is close to perfection: While there were several steps necessary in the past, now all you need to do is to plug in the power cable and run the app. It will automatically detect the new, unknown PLAY:5. How does this work? It is not even in my home wifi – yet it can be found. Then the app asks to press the button on the back. This causes a bell sound and only ten seconds later the speaker is integrated into the wifi network. Fantastic! Unlike the PLAY:3 the PLAY:5 can stand on three sides: The long bottom side and the two short sides. The PLAY:3 is supposed to stand on only one of its sides. Another quite remarkable difference is the control panel. The well-known buttons with their typical haptic has been removed. I don't particularly like this innovation, but I guess this is a general trend these days. Accordingly, the speaker can be controlled with swiping and touching now. And this does actually work quite well: Swiping from left to right on the touch-sensitive surface makes the speaker play the next song. This also works in reverse. Feedback for volume commands is not haptical but with a soft sound. And a soft, white LED informs about the status of the device: Solid white shows, that the speaker is active and ready to play. Green shows that the speaker is booting or ready for setup. Unfortunately, there still are no customizable buttons for favorites, such as radio stations. 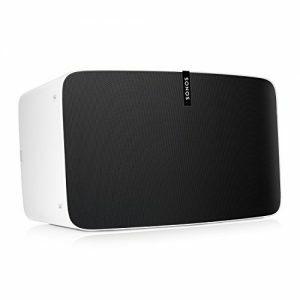 Will Sonos ever have them? While there's life, there's hope. Luckily, not all advantages of the predecessor have been removed. Such audio jack to plug in AUX devices, for example your MP3- or CD player. The Sonos Connect is the only other Sonos device to offer this feature! If you want to DJ at home you can also connect a controller via AUX and manually mix music that will be played absolutely synchronous on all of your Sonos speakers! This works perfectly fine at a latency close to zero. Unfortunately, the AUX port requires the speaker volume to be turned up quite high, as it only provides a very faint signal. Theoretically there is also an ethernet port to connect the PLAY:5 directly to your network, if wifi is not working well. 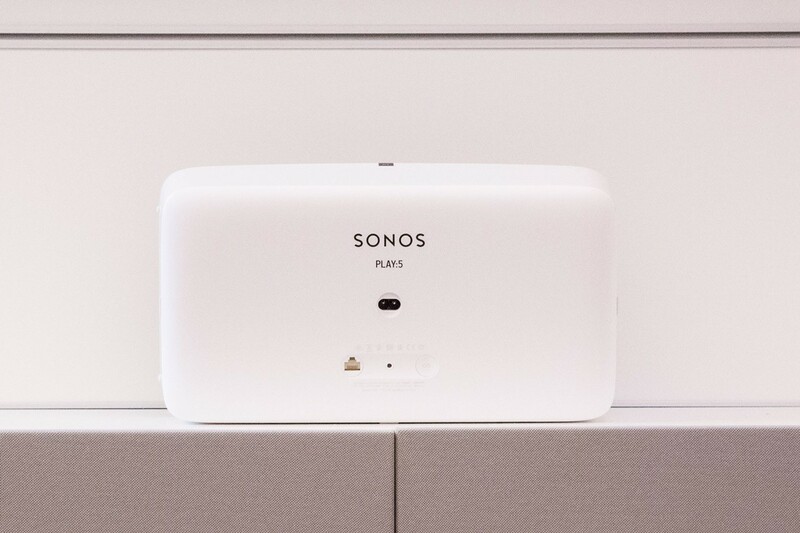 There is also a Sonos Booster available to improve the Sonos signal in a wifi network. Handling is one of the most impressive strong points of Sonos. Their innovation is so far ahead, that the app could take years to mature to perfection. And it is really flawless, indeed: Sonos offer integration of the most music streaming services. Speakers can seamlessly be grouped and ungrouped. You can even use the app for your friend's Sonos system without deleting the settings for your own system at home – and even use more than one Spotify- or Soundcloud account. All of this while playing absolutely stutter-free. The only thing I am not completely satisfied with is handling of Spotify, which only works when using the Sonos app. BOSE offer a solution that I would prefer in the Sonos app: a kind of mix of Spotify integration and Spotify Connect. This makes the Spotify app able to control the speakers. You can find out more about the app in the multiroom guide. Update: Sonos integrated Spotify near to perfection like BOSE. You can now use native Spotify-App and switch playback to Sonos speakers. As Spotify-Lover you will not need to use the Sonos app any longer. The PLAY:5 is big. Probably twice as big as the PLAY:3. My expectations were accordingly high – and I was not disappointed at all. The warm, full-bodied sound is rich and subtle at the same time. Soft music and powerful party music are being played back distortion free and can be played very loud. Medium sized rooms are no problem for this speaker. For a better sound distribution through the room two PLAY:5 speakers can be connected to form a stereo pair with an even more broad sound. And the bass is very generous, strong and present: I turned it to half power, the speaker is surely fun for bass enthusiasts. What often troubles me with powerful speakers are the vibrations that they transmit to any surface they stand on, even at low volume. This is no problem at all with the PLAY:5, even when playing music loud. I really don't know how they do it, but the drivers seem to be balanced very carefully. This makes finding the right place for the speaker much easier – which should not be taken for granted! Sturdy speaker with excellent sound and well-engineered handling, which requires an app but works intuitively and reliably. Preset buttons would have been nice.